akiko "kewpie" hiroshima (singer) was born in japan and moved to america for college. she has appeared on the stage and screen, and is happy to wear a pink wig for happyfunsmile. brian nishii (singer, master of ceremonies) is at least a quadruple threat as an actor, singer, dancer, and bilingual radio personality. he lives in los angeles with his wife and two beautiful children. rodrigo morimoto (singer) is a man of the world, growing up in brazil and moving with his family to nyc to work for the united nations. rodrigo started singing with happyfunsmile after a fateful night at a midtown karaoke bar. wynn kiyama (founder, chindon) started with a large collections of enka records, a gifted purple haori, assorted taiko drums, and a whistle. with that, happyfunsmile was born. doc bill boyer (sanxian, sanshin) likes to play any instrument with strings, but hates frets. "dang, i hate frets," says bill. josh (saxophone) draws from a wide range of styles, but distills his musical essence into one recurrent theme. "pythagoras suwitchi," he sez. glenn nataupsky (bass) has been on tour for quite some time, playing bass for every show you've ever seen. now he lives in new jersey with his wife and son. 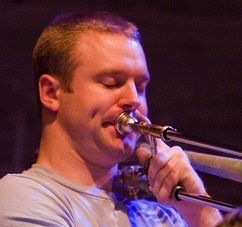 ben gallina (bass) moved to nyc from his hometown of rochester, new york. he believes in the transformative power of meditation and insight to lessen the suffering of the planet and heal the conflicts of the world. ryan dorin (keys) is best known as the twelve-fingered pianist in the sci-fi classic gattaca. he composes music, creates animated shorts, and enjoys johnny walker black on the rocks. red wierenga (accordion) is a master of both the pianica and the tenor melodica, dazzling audiences with his lung capacity and finger dexterity. also an accordionist, pianist, and respectronicist. 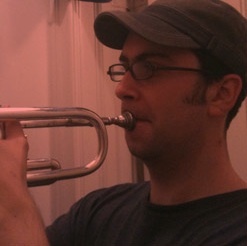 eli asher (trumpet) plays just about everything, from screaming bebop solos and free jazz to bulgarian tunes and hasidic wedding favorites. now he's doing enka! james hirschfeld (trombone, tuba) just bought a big tuba and carries it around on the subway. that's why he's the best. 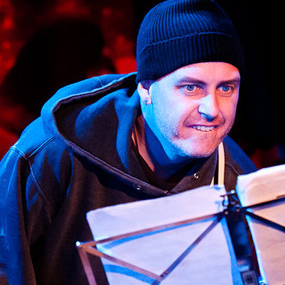 devin hoff (bass) plays punk, metal, jazz, experimental, and you may have seen him performing with cibo matto! but yuko and miho, we got him first! hitomi oba (sax) plays tenor saxophone with tons of people in la, and we're lucky to have her on the happyfunsmile roster! miho tsuji (vocals). what can we say? she was the woman with the golden voice and natural presence who started it all! living in saitama with her husband and two boys! kaori ibuki (singer) graduated with an advanced degree in theater history from the city university of new york. she studies nihon buyo with the fujima school and, as such, is the lead bon-odori dancer for happyfunsmile. kaori is now back in japan. kossan (sanshin, singer) is a zen monk who roller blades around the city and performs okinawan songs at bars, restaurants, and subway stations. needless to say, he was featured on the new york times blog. kossan now lives in okinawa. ali sakkal (sax) is friends with wynn's brother. for some reason, that means he has to play with happyfunsmile. ali now lives in north carolina, we think. rob perle (sax) is a businessman by day, saxophonist by night, and rugby referee by weekend. michael quintero (percussion) hits things. these days, he is hitting things in colombia and maine.